KHAN AL-AHMAR, occupied West Bank – My name is Eid Khamis, and Israel wants to destroy Khan al-Ahmar, the village I have lived in my entire life. I was born in this village; I got married in this village; had my children and married them off in this village. All of my memories are here, both the good and bad. I have been here for 52 years. We were forcefully evicted from our original lands as Bedouins in the Naqab desert by Israeli forces in 1951, and today we are forced to live in steel huts and struggle for the most basic of human rights. Our grandfathers lived in Tal Arad, overlooking the Dead Sea. The lands were for our tribe – the Jahalin – and each family had their own plot of land, which they farmed and used for herding livestock. They grew wheat, barley and lentils. When we were displaced into the West Bank, we travelled as nomads until we settled in Khan al-Ahmar, to the east of Jerusalem. There were two water sources, space for herding and the market in the Old City of Jerusalem to sell produce such as yoghurt, milk and butter. We leased our lands from private Palestinian landowners in the city of Anata nearby. We developed close, beneficial relationships between the villagers and the Bedouins. The landowner would take 50 percent of our proceeds. Matters were peaceful until 1967, when Israel occupied the West Bank and East Jerusalem. In 1975, the Israeli army expropriated the area and declared it a closed military zone for the establishment of illegal settlements nearby. The army has demolished many structures, including homes, over the years and made our lives increasingly difficult, in hopes of coercing us to flee. Today, after more than eight years of a legal battle – with lawyers, court sessions and submissions of master zoning plans – the Israeli High Court of Justice decided on 5 September that the village must be demolished and rejected all of our suggestions. The problem of Khan al-Ahmar is bigger than the village itself. It is not a construction problem or the problem of a school. It is about the establishment of a Palestinian state; the so-called peace efforts depend on this village. If this village is demolished, then the Palestinian dream crumbles. Israel wants our land for two reasons. Firstly, Israel has already blocked off the West Bank from Jerusalem from the north, south and west by creating a ring of settlements around the city. Now, the Palestinians only have one gate to Jerusalem, and that is the east – where we are situated. The occupation intends to close off the final gate to Palestinians. Secondly, they want to build a corridor through the width of the West Bank, to the Jordan Valley, and build settlements along this area. To do that, however, they need to get rid of the Bedouins. Once they do this, the West Bank will be cut in half. How would you establish a Palestinian state then? Our problem is that we are defending all the Bedouins and Palestinians in this area, but no one is defending us. The issue is not that they will be demolishing my home, but that they will be closing off the road to Jerusalem; our state will disappear. The position of our community – surrounded by the settlements of Kfar Adumim, Maale Adumim, Alon and Nofei Prat – makes us one of the final obstacles for completing this Jewish corridor between Jerusalem and the West Bank. When Israel began building the separation wall, it killed the livelihood of all the Bedouins east of Jerusalem, because that was their centre of commerce. They separated all the Palestinian neighbourhoods around the city from Jerusalem, and we are all suffering. We are not asking for a village in the middle of London or Hawaii, we are asking for basic human rights. A school for the children, a clinic for the village, people to live in homes that could at least protect them from the heat of the sun and the force of the rain – these are basic human rights. We have not even been allowed to renew our homes. The wood we used to build them has been there for more than 20 years. It’s broken. We haven’t been allowed to replace it. The occupation forbids it. We used to live in homes made of sheep wool, which would keep us insulated. But since the number of our livestock has severely decreased, we can no longer afford to make our homes from sheep wool. Bedouins then turned to zinc and wood. In the summer, it turns into a sauna. In the winter, it is freezing. We’ve been living like this for about 25 to 30 years. I think that this is a big Zionist project – larger than all of us. If Israel does not face more international pressure than this, then it will demolish the village. Israel’s right-wing media and politicians are waging a war against us. They are trying to pressure their government to demolish our village. Unfortunately, the issue of Khan al-Ahmar is discussed much more in Europe than it was in Ramallah. We are depending on the Europeans, who have been supporting us all the way through this ordeal. 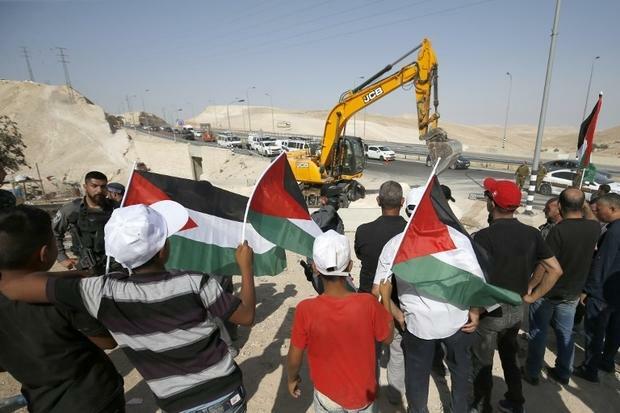 But if that is not enough, Israeli bulldozers will come for the village. And we are prepared for them. We intend to remain here, even if they demolish it; we will rebuild over and over again. If they displace us by force, we will move across the street. This is our decision – we will not go back on it. Where should we go? The only other option is the right of return, back to our lands in the Naqab. Our fields were taken over by Israel and classified as “absentee properties” after the 1948 war. But we are not absent – we’re right here. 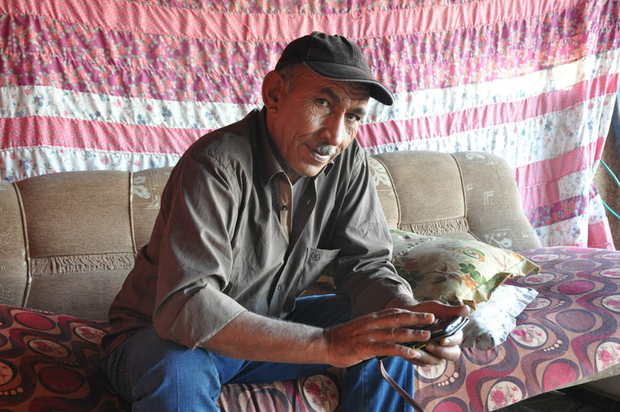 – Eid Khamis is the community leader of Khan al-Ahmar.